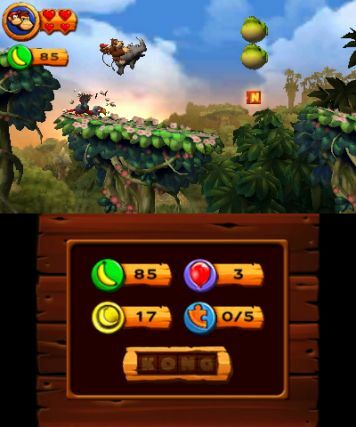 Two and a half years ago, Donkey Kong Country Returns hit the Wii with a gorilla-sized thud and delivered not just one of the system’s best platforming experiences, but also one of the most enjoyable (and frustrating) of the generation. Like the original DKC trilogy, Returns had a slew of tough stages, great music, and tight controls. However, the Wii exclusive featured some shoe-horned forced controller-shaking, largely needless mic-blowing, and the lack of buttons didn’t allow for the same kind of tag team tactics as those games. So while it looked outstanding, with sharp character models and stunning silhouette stages, it still fell short of the heights reached in the first two DKCs. Now, with a bit of time passing and some refinements, the game has hit the 3DS. The original game delivered great platforming, but it was one of the system’s toughest games. The only thing that could really help you beat it if you died a lot was the Super Kong Guide, which would beat the stage for you. Players who wanted to beat the game, but just couldn’t get past a certain point, either had to perfect the stages or deal with the game beating a stage for them – there was no middle ground until now. The 3DS remake gives you New mode, which offers up more health, power-ups in Cranky’s shop and generally makes the game a bit easier. If you still want a huge challenge, you can take on the game in its original form – both still use Super Kong as an option if you so desire. The core game is the same as it was before, with some pros and cons based on the lack of motion controls. The Wii remote controls weren’t ideal, but when using a BOSS shell, everything was pretty easy to execute outside of the roll. It required shaking the remote, which was tougher to time in line with precision platforming because it didn’t involve a button press. The lack of the Wii remote having easy to access buttons clearly hurt the game, which gave this 3DS version a chance to right some wrongs there. For the most part, it does, but this version brings about some strange changes. The use of X and Y to slap the ground, blow pedals to reveal items, and punch bosses or end of stage barrels works nicely and are perfect example of the controls being improved. However, the use of only the circle pad for movement is puzzling. The d-pad does nothing, and it makes no sense given that this is a side-scrolling platformer that requires perfect timing – and it’s easier to time your movements using a d-pad since you can feel exactly where you’re pressing it and how far. With the circle pad, you do know where you’re pushing it, but it can be hard to tell how hard you’re pushing it depending on how you’re holding the system. 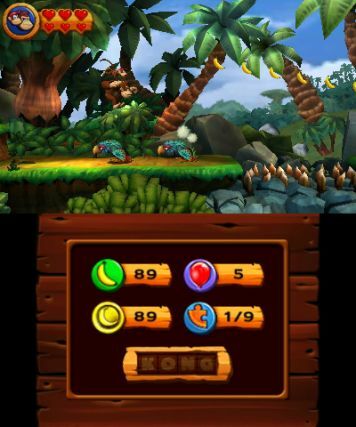 This makes controlling DK through the original game a bit harder than it was in the Wii version, which combined with the smaller screen, makes it the most challenging incarnation. The revamped game is still a bit tough to control until you get used to the circle pad, but never quite feels as comfortable as using a sideways remote with a BOSS shell attached to it. Thanks to all of the power-ups and health though, the control changes never gets too frustrating in new mode. I can see folks avoiding the original mode though since it will naturally take a lot longer to beat, and on a portable, that can be a bit of a killer. Visually, the game appears to be a bit sharper than the Wii original and benefits from the top screen’s widescreen view. The stages themselves look a bit larger as a result of it, and the more cinematic view really makes the already-dazzling silhouette stages pop even more. Those expecting a complete overhaul may be a bit disappointed, but the Wii game was one of the better looking games on the platform, and has held up nicely both there and here as well. When you’re playing it, there’s no feeling of “well, that should be better or that could be better” – everything looks about as good as you want it to and it doesn’t seem like a game in need of any graphical overhauls anytime soon. Some 3DS optimization for the background barrel blasting sections would be nice though. The developers didn’t zoom those in, resulting in a really zoomed out view on a small screen that makes it nearly impossible to see where you are in relation to enemies. Like the pad-only controls, it will result in some needless hits that make you glad the game gives you the option of having more health than before. 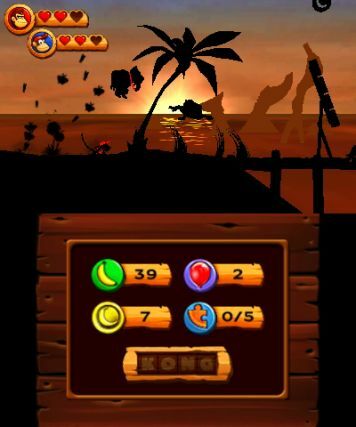 DKC Returns 3D retains the original’s outstanding soundtrack. Like it, and the original trilogy, you’ve got a soundtrack full of catchy music that stays stuck in your head. It also sounds a bit better here than on the Wii, but that could be due to having the option of using headphones instead of relying on speakers. The lack of tinny sound effects coming from the remote also helps the overall sound design – a case of addition by subtraction there, while the regular sound effects of cartoonish pain and bounces and the like work well. 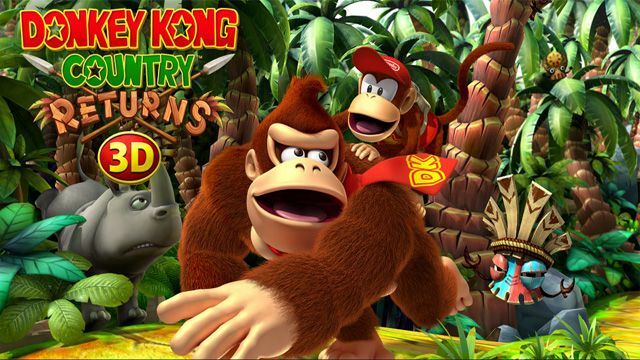 Donkey Kong Country Returns 3D is an outstanding platformer that falls a bit short of being the best on the system, and while it feels like the most definitive version of DKC Returns yet, it still doesn’t feel like the game is as good as it could be. This incarnation is held back by the circle pad-only movement and small screen making some of the more zoomed-out sections hard to see. It’s a shame there are still rough edges in it because the original game had some that were cleared up, and then new ones cropped in to replace them. Hopefully, we get a definitive version of the game with each existing version’s problems scrubbed free. Until then, it’s hard to recommend buying this if you’ve beaten the original, but if you loved it, couldn’t beat it, and want to give New mode a shot, it’s easily worth either buying it at a lower price point or simply renting it. 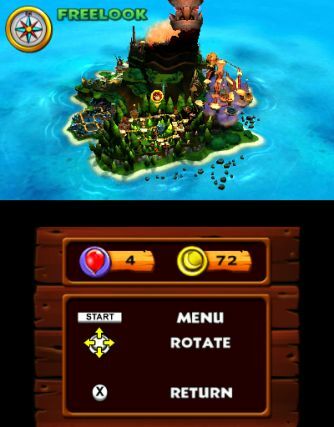 This review is based on a copy of Donkey Kong Country Returns 3D for the Nintendo 3DS purchased by the reviewer.